How do you juggle this many characters and keep the story coherent must have been the chief concern for this movie. I found that they had a difficult a strained job doing so but I enjoyed the complexity immensely. Spiderman is one of my favorite superheroes due to his character development. In the third installment of Spiderman Tobey Maguire doesn’t let you down with showing you different sides of our hero. While I found the transition to Emo hair for dark Spiderman funny … the rest of Maguires performance was great. In addition while others have difficulty with the complexity of villains, I found it refreshing. Having characters that do bad things for good reasons is always a great twist on villains. I also found the constant theme of forgiveness to be a great way to show depth of character among hero and villain. The ability to forgive is one of the characteristics that often separate the hero from the anti-hero. It helped to further define Spiderman as a true hero. 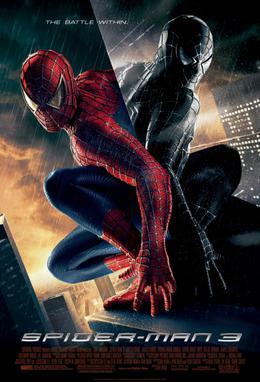 Spiderman 3 was well worth the price of watching it in the theaters.